We provide our industry-leading sector solutions to our valuable clients. In this series we also provide them with real competitive advantage. 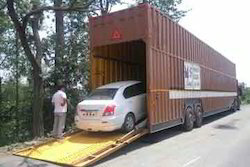 We are also involved in offering premium and personalized car carrier services. With this service we can also carry, load and unload your vehicle esp. Cars to their destined locations. We are counted as one of the leading service providers of Automobile Transport Services.Due to their cost effectiveness and execution within promised time frame, the tempo services are highly demanded among our patrons. Note : We provide Our Services only from Mumbai to Gujrat, Delhi to Gujrat, Gujrat to Mumbai and Gujrat to Delhi. Royal Cargo knows Your vehicle is not just your car, but a precious belonging that you want to keep safely and with care. So avail of these services and be happy that you have made the perfect choice with us. Opus worldwide Provides Specialized vehicle relocation and storage services to the corporate over two decades of experience and utilizing a large multi confidence and reassurance to our customers while transporting their you organize all necessary documentation for exporting.